This isn’t the shore of Lake Hoare, this is what large sections of the lake surface looks like when you walk onto it, especially at the end closest to the Canada Glacier. You wander between flat-topped structures two to three feet high, the tops having formerly been the surface of the lake. 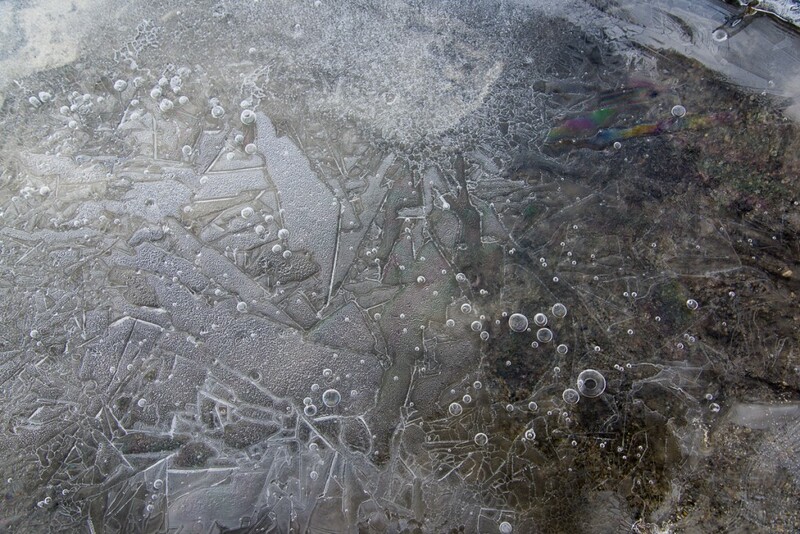 The rest of the lake has ablated (vaporized into the air) leaving this peculiar world of glass-like ice architecture and thin, delicately etched pieces on the sediment around them. 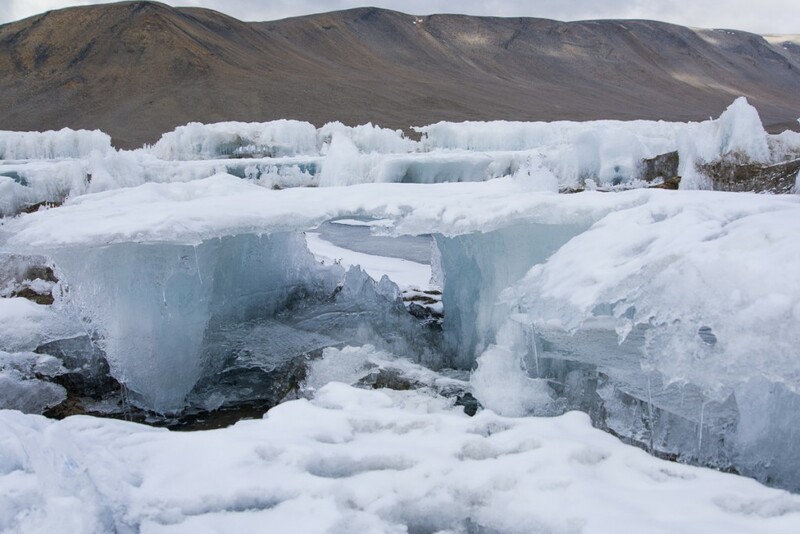 As I mentioned in a previous post, the lakes in the Dry Valleys have a permanent crust of ice that’s on average four meters thick, a thickness that stays constant from year to year. The lakes themselves can be as much as 30 to 112 feet deep. The thick ice layer is added to by water freezing from the bottom, while the top is lost to ablation — that is, it goes from solid to gas. Scientists who studied the lakes used to think that 30 cm was added to the bottom and 30 cm was lost from the top each year, but recent research suggests that the average rate is more like 75 cm. Some of the tops cantilever out so far without much support you wonder how they haven’t collapsed yet. 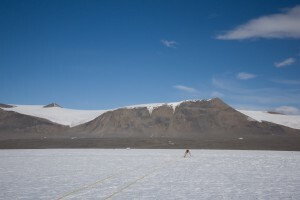 Lake Fryxell has some flat-topped ice structures at the end near the Canada Glacier, but they aren’t as extensive or complex as the Lake Hoare ones, and are spaced farther apart. Most of Fryxell looks like this. Researchers routinely drive an ATV across it with ease. In December, even with temperatures that never get much above freezing, under the 24-hour summer sun a moat melts around the shallow areas of shoreline. 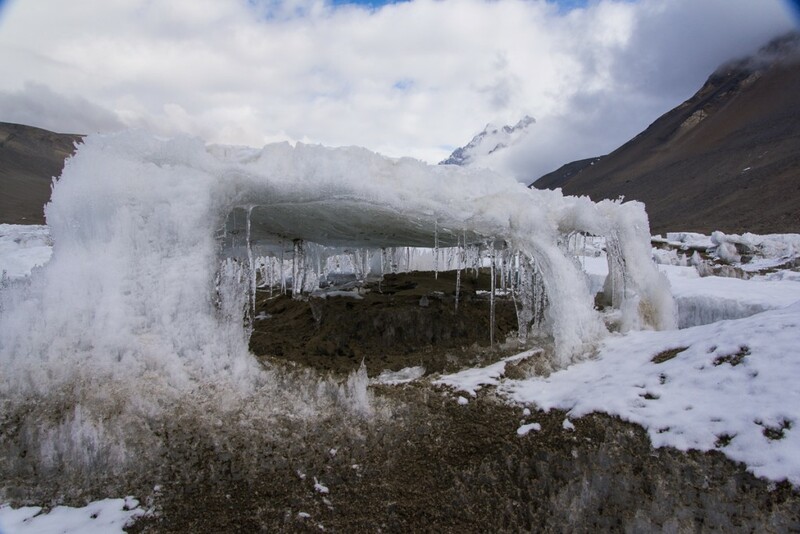 The width of the melted water and adjoining thin ice varies and camp manager Rae cautioned that it can change from day to day. So getting out onto the ice on Lake Bonney while I was there only necessitated about a six foot walk on a plank of wood the limnology team placed there, while to get on Hoare a more substantial (although still pretty makeshift) bridge of lumber lashed to pipes was needed, and at Fryxell there was a rowboat with a rope pulley rigged up to cross the much wider moat of shallow water. 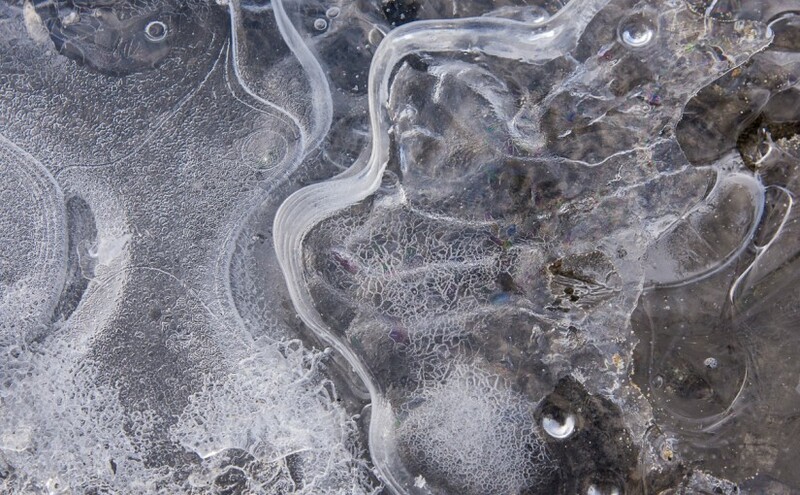 Once you get onto the lake ice, any ice that’s rough and crunchy is a better bet to walk on than ice that’s smooth and blue, because it’s older and likely to be thicker. Both Bonney and Fryxell were relatively level and stable to walk on once you got across the moat. In fact, on both those lakes, the researchers drive around on an ATV if they have a distance to travel. Sometimes it’s difficult to know what’s under the fresh snow surrounding something like this structure (doesn’t it look like a little pavilion? 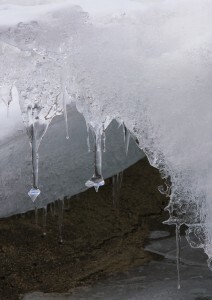 ): more sand, firm crunchy ice, or a coating of ice hiding six inches of water. Hoare is different. Ice that has a thick layer of sediment blown onto it is generally firm to walk on, but you still have to watch where you step or you may end up in ankle-deep — or mid-calf-deep water, as Mari (a McMurdo field center worker who was helping out at the camp the week I was there) and I discovered when we returned from a hike to the other end of Lake Hoare one day. 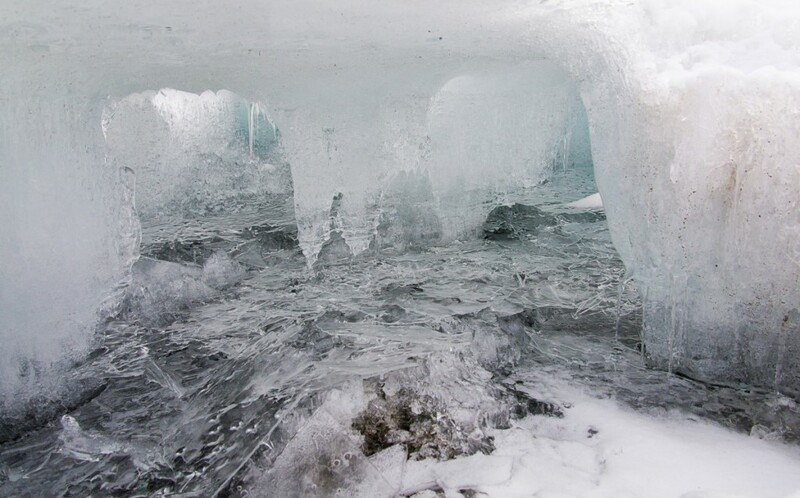 We had hiked down to the Suess Glacier via a little footpath that followed the shoreline, and had been told if we could get onto the ice down there, we could just walk down the middle of the lake on the way back as long as we had on ice crampons, so we wouldn’t slip. We started back on the trail, then after about 10 minutes we saw a spot where we could just take a giant step across the moat onto the lake. This appeared quicker and more direct than the land route we’d taken earlier. Turns out, slipping on slick ice was not the problem. After about 15 or 20 minutes, Mari tripped when her foot abruptly punched through to her mid-calf. She scrambled to her feet. We were both a little spooked, but it seemed to make sense to continue rather than double back. Seemed. Some parts were solid, while others made an ominous hollow sound, and they looked pretty much the same from the top with the slight coating of snow remaining from the storm a few days before, which definitely obscured thin areas that would otherwise have been more obvious. We zigged and zagged from one highly uneven patch of sediment to another, sometimes making good progress, but punching through up to our ankles periodically. This was unexpected after my experiences on Lakes Bonney and Fryxell. I had already walked out onto Hoare with Dave, one of the scientists, and hadn’t encountered this much difficulty. That’s when I took some of these photos — the others I took on another walk onto the lake with him the day after Mari’s and my adventure. But Dave’s been coming here for several years and can size up where to walk pretty readily. At one point, Mari said, “I just remembered, in case you don’t know this, if you fall in, you’re supposed to stick out your arms straight in front of you like this and catch the edge.” Then we started laughing at the absurdity of the situation. 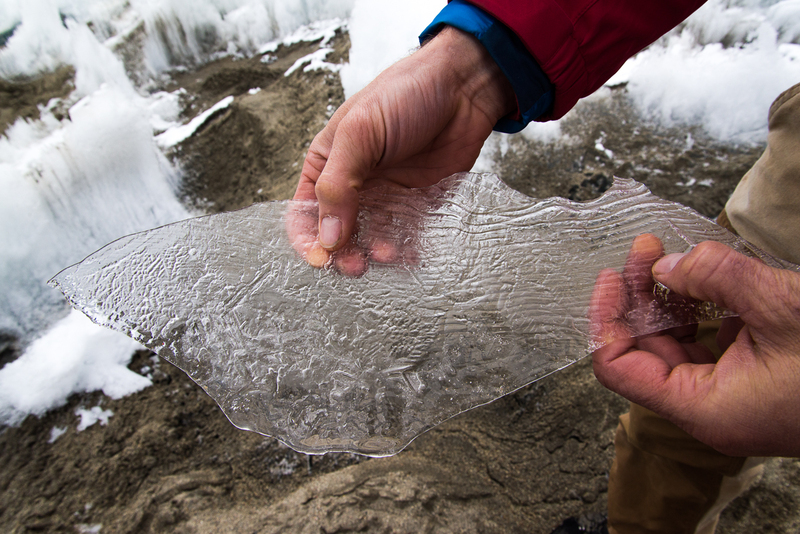 When thin sheets of ice break, they look and sound like broken glass. You can see how some of these ablated areas get hollowed out underneath, and continually melt and refreeze into layers of thin ice. 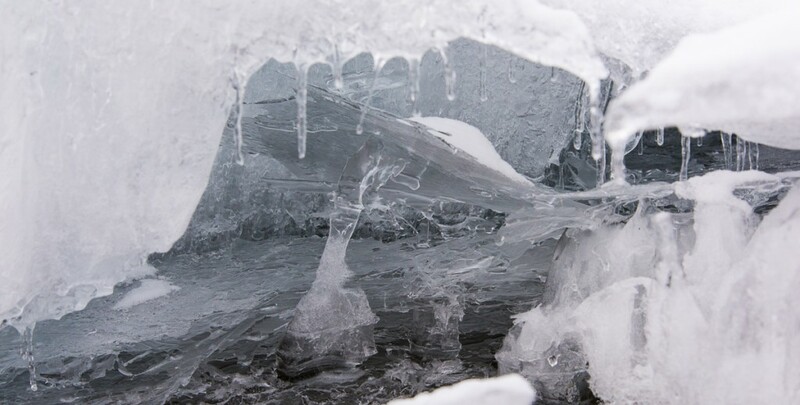 None of the areas of thin ice were more than a foot deep before you hit the permanent lake ice, but it still was unnerving. Also, sometimes there was no water under the ice, but it shattered with the sound of breaking glass, which I think we’re all hard-wired to find jarring even when we’re not worried about stepping in the wrong place. We didn’t see any narrow moats to cross back to the shore, so we ended up walking cautiously down the middle of the lake, and kept camp manager Rae informed over the two-way radio of our progress. Our “shortcut” ended up taking an extra hour over the path. Boy, were we relieved when we stepped off the bridge onto the shore. Antarctica continually surprised me. 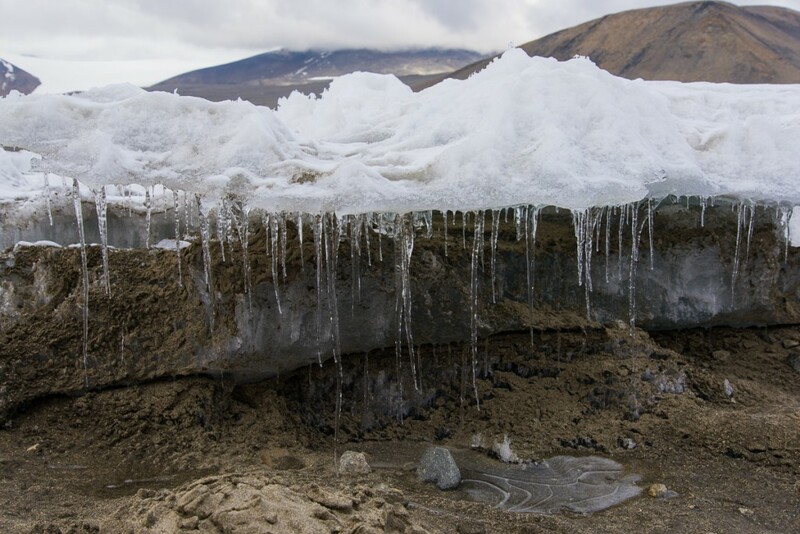 One phenomenon — in this case ablated lake ice — has surprising permutations in one relatively small section of one lake. As long as I knew I would not end up in freezing water up to my armpits, I enjoyed walking around with my camera looking for interesting formations and peering inside the taller ones, which were about knee high. There is no shortage of oddities and we didn’t have to walk far to find a wide variety. Some were like thick glass pillars. The ones at left looked like part of a chandelier. 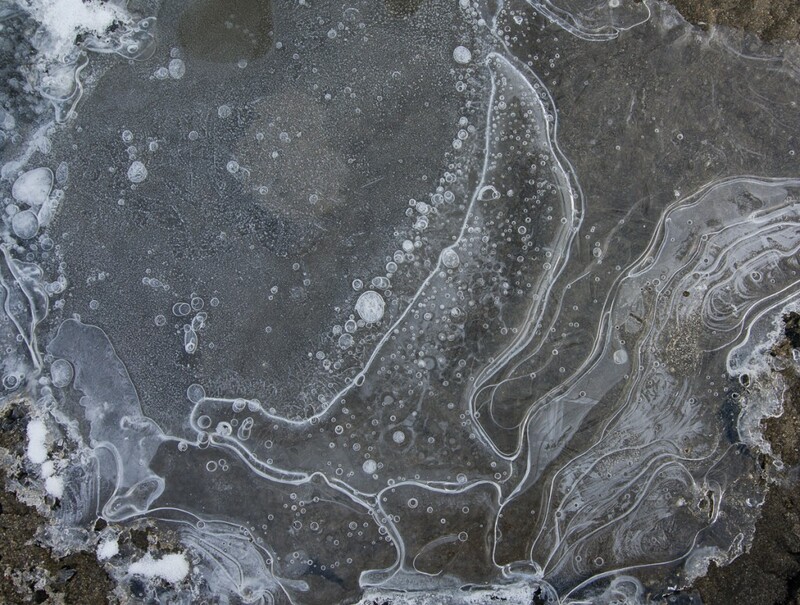 Then there was a whole other world of fascinating designs that looked drawn or painted on thin layers of ice that had formed on the surface of the sediment. I’ve zoomed in on the formation at left so you can see how a thin ice layer has formed a rainbow-colored interference pattern. 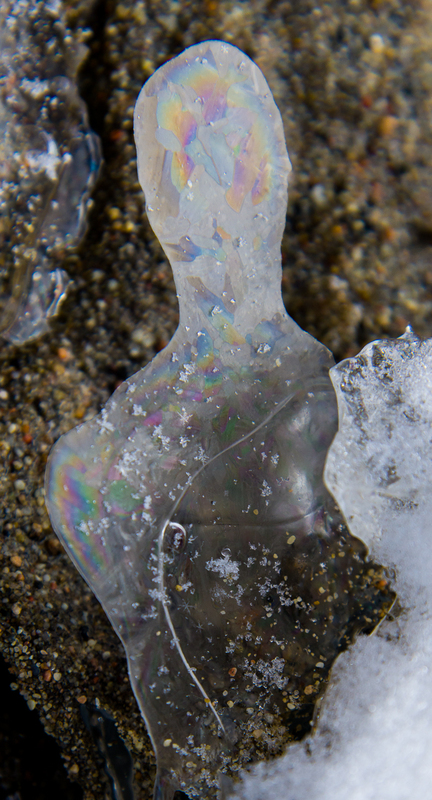 A lake ice trifecta of Tyndall figures, bubbles, and a rainbow-colored interference pattern upper right. I call this one, “The Skua.” Kind of looks like a bird in profile, right? There actually was a skua that sometimes came around the Lake Hoare camp, which the staff and scientists had nicknamed Taylor, since the camp is in the Taylor Valley. Though a lot of people at McMurdo view skuas as pesky, the Hoare camp always got a kick out of seeing Taylor, since he/she was the only bird in the area. Otherwise, the only animals in the Dry Valleys are microbes and nematodes. 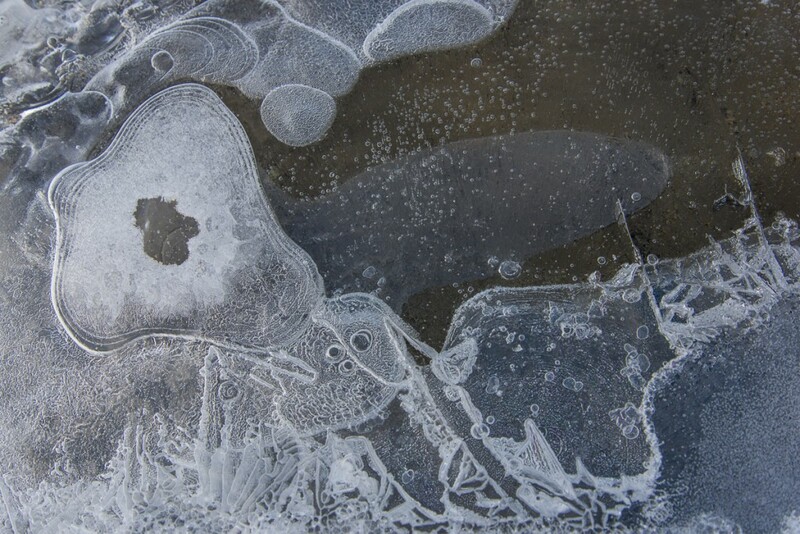 More abstract art from ice. 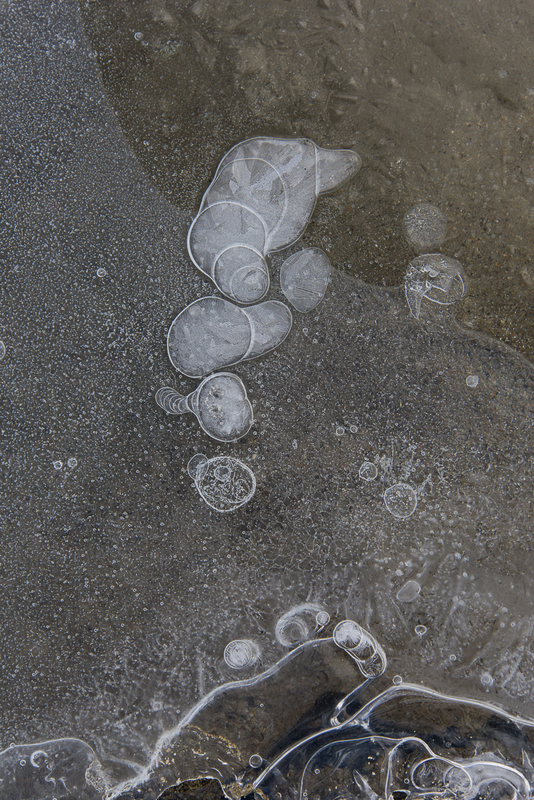 You can see how thin many of these formations lying on the sediment are. A series of drips freezing a leaving a white outline? A drop leaving traces of its path as it moved? However these formed, the result is delicate and lovely. Ooh Helen, you have walked into a rarefied world few have seen….thanks for sharing and the happiest of new years……filled with creativity! Wow Helen!!!! These photos are special. Visuals the public would never see or interact with, if not for encountering your narrative and art. Congratulations on capturing such special and rare aspects of nature! !